It has been one year since Emory University Hospital prepared to accept the first patient to be treated for Ebola virus disease in the United States. "Treating Patients with Ebola Virus Disease: Lessons Learned" is the topic of a talk by Bruce Ribner on Thursday, Aug. 13, at 7 a.m. in the Emory University Hospital Auditorium. The event is free and open to the public. It is part of the August Surgical Grand Rounds series. 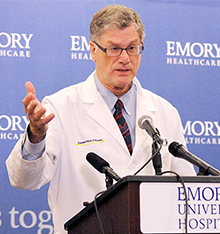 Ribner is the medical director of the Serious Communicable Diseases Unit at the hospital and led the treatment of the four Ebola patients admitted to Emory. He will describe the epidemiology of Ebola virus disease; the clinical management of patients with Ebola virus disease; and keys to safely caring for patients with Ebola virus disease. Ribner is also professor of medicine in the Division of Infectious Diseases in Emory School of Medicine. For more information, contact Nena Buie.